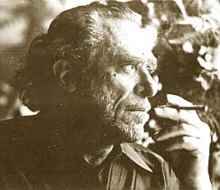 A storyteller of a poet, Charles Bukowski was a working guy who wrote about the seedy side of life. He didn’t just write about it, he embraced it. Of course he lived in Los Angeles, but still. After a couple small successes in his twenties, he got sick of the literary world and spent ten years working for the Post Office. Eventually he got tired of being a drunken blue-collar worker, quit, wrote the novel Post Office in three weeks after quitting his job, and became a drunken man of letters instead. He went on to skewer just about everything in his poems and other writing, going especially rough on the literary scene of his time. and throw words at you. or an apple is a pome. the knowledge of it knocks you off balance.